Hiking with a dog can be one of the most enjoyable bonding experiences you’ll ever have with your furry friend. Making it a regular activity allows you to handle all sorts of challenges together, from overcoming trail obstacles to trusting each other for security and affection. As sturdy as dogs are, though, there are a number of potential dangers they’ll face when hitting the trails with you. 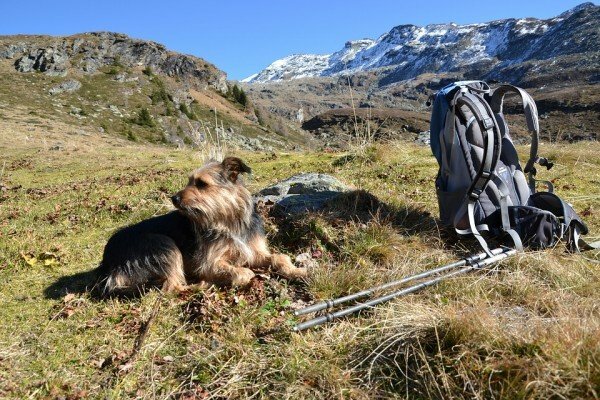 Here are 5 trail dog-related trail risks that you’ll want to be aware of if you are hiking with a dog. Think about a time when you were hiking and it got really hot. Now, imagine that you were covered in thick fur. Unlike humans, dogs “sweat” by panting and even release heat through their foot pads and noses. If it’s too hot and your dog can’t adequately cool off, then they face some potentially serious health risks, such as organ failure and death. To prevent this, avoid hiking when it’s very hot or during the middle of the afternoon when the heat is at its peak. Also, it’s wise to take several water breaks and find some shade often. The signs of heat stroke in dogs include anxious behavior, heavy panting, excessive drooling or hyperventilating. Notice your dog displaying any of these symptoms and it’s time to forego the hike and get him to the vet ASAP. Coyotes, wolves, moose, bears, mountain lions, rattlesnakes, alligators (if you’re from the south)—the list of potentially dangerous wildlife goes on and on. Come up against one of these guys and it may spell danger for both of you. Use a leash to prevent any potential encounters with predators, even if you’ve trained him well. Don’t make me dig up the “Better safe than sorry” talk. Keep in mind, too, that not all risks have four legs and weigh 500 pounds. Depending on where you’re hiking, fallen timber or rocks can conceal anything from rattlesnakes to fire ants and it can be difficult to keep your curious pooch from investigating these spots. Do your best to keep your dog away from the thick foliage and fallen timber that often lines the edge of the trail and if you come across a fallen log crossing the trail, it may even be best to carry your dog across it. Sometimes the biggest risks come in the smallest packages. Not only are ticks and mosquitos potential carriers of disease, but allowing your dog to drink from standing or contaminated water can lead to disease, as well. You can take preventative measures by giving your dog a monthly dose of FrontLine or HeartGard, which fight fleas and ticks and heartworm, respectively. Also before hiking with your dog, make a trip to your vet to make sure your pup has been vaccinated against anything he may face on the trail, especially if you and your dog are regular trail visitors. Like a human, dogs can sometimes hurt themselves on well-hidden obstacles, such as holes, shaky terrain, thorn bushes or even a sharp protruding branch. This can cause sprained or broken bones or even lacerations and puncture wounds, all of which can worsen quickly in the backcountry. I know your dog is likely excited about all the new sights, sounds and smells, but, again, do your best to keep him leashed and close to you at all times. Before hitting the trail, do some research to ensure you’re not hiking where hunters like to hang out. Sometimes in thick foliage or low light conditions, hunters or hikers who carry handguns for protection may mistake your dog for a bear or wolf and they may shoot out of panic. Make sure your dog wears a brightly colored collar or vest and it may be smart even to attach a bell to them so they can make plenty of noise to distinguish themselves as a pet and not a predator. In areas where trapping is permitted, leg traps and even wire snares are also risks to look out for. Again, keeping your dog close will be a big help. It’s also smart to familiarize yourself with these traps and how to remove them, especially if you regularly hike in areas where trapping is allowed.